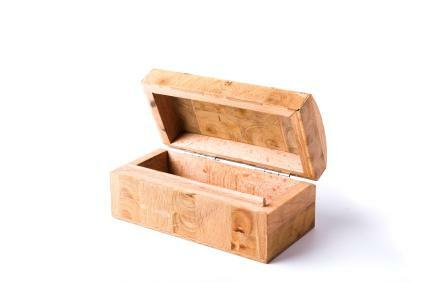 Many people think hardwood coffins or metal caskets are the only options for their loved one's burial, but pressed wood caskets are also an option. Find out why pressed wood coffin features are simpler and less expensive than traditional caskets and then consider whether one's the right choice for your situation. What are Pressed Wood Caskets? These caskets cost considerably less than metal or hardwood caskets. Pressed wood caskets are priced at under $700. Metal caskets are often more than $2,000. Often pressed wood caskets are thought to be more environmentally sound. However, many of these caskets use glues or fillers that contain toxic materials or formaldehyde, thereby making them not completely earth friendly. Many times these caskets are covered in cloth and have finished interiors. The type of fabric can be selected by the family. Sometimes loved ones are buried with a favorite blanket or quilt. In the United States, the most popular caskets are made of metal. The next most sold are made from hardwood and pressed wood caskets have the lowest sales. Clean pressed wood caskets are more chemical-free than regular pressed wood caskets. They are biodegradable, making it so the body can naturally return to dust. Descriptions and photos of these caskets can be found at The Natural Burial Company. This company aims to provide earth friendly means of burial. If you are interested in a green burial, this may be the option to think about. A person has the right to choose the funeral goods and services he or she wants. There are a few exceptions to this rule. If your state or local law requires you to buy any particular item, the funeral provider must disclose it on the price list, with a reference to the specific law. The funeral provider that offers cremations must make alternative containers available. Now that you know about pressed wood caskets, you may want to consider discussing their benefits with your aging parents or loved ones. The time to think about pressed wood caskets is now. When your loved one dies, many decisions will have to be made and the more plans you make prior to his or her death, and the hard grieving journey that follows, the easier it will be on you.It would be beneficial to you to inquire with the cemetery where your loved one plans to be buried to make sure that the type of casket you are considering is allowed before finalizing your burial selection.